Built in 1898 on the 15 acres of farmland owned by Gabriel Block Wathne’s parents, Kronen Gaard Hotel came from humble beginnings as a personal summer country residence with Swiss chalet-style architecture. Wathne, a timber merchant, and his wife Beate, along with their six children, frequently entertained guests at their summer residence. In 1925, the Wathnes sold the home to Austrian Franz Salerius Faydt. Fleeing Austria for Norway to avoid military service, Francis Salerius Faydt moved to the country to live a life of solitude until his death in 1928. It was then sold to the sister of Dale, Gudrun Baade Jensen, who used the home as a women's psychiatric nursing home. The serene and tranquil surroundings invited an idyllic setting for relaxation and rehabilitation. Deacon and nun, Kjell and Sygni Steinsvåg, purchased the facility in 1953 and continued to run the institution, named Trodne after the spring water surrounding the fields, until 1985. After 57 years, the psychiatric facility closed and was renovated and converted to start operating as the luxury country Kronen Gaard Hotel. 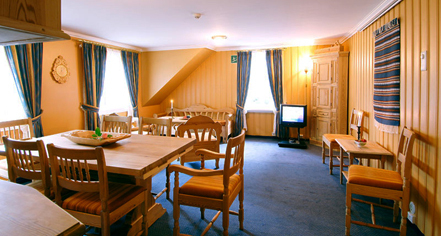 The Steinsvåg's endeavor proved to be successful as they continued to operate Kronen Gaard until 1993 when their son Helmer took over management and remains today as head of the hotel. 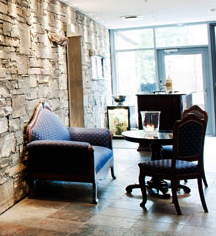 Kronen Gaard Hotel, a charter member of Historic Hotels Worldwide since 2012, dates back to 1898.